JustOn can business-related information and errors. Generally, it writes the logged data to files attached to invoice run, dunning run or subscription records. 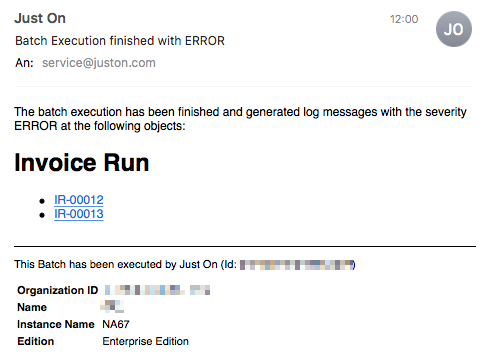 In addition, JustOn allows for sending information about batch chain execution via email. Operations like deletions, status modifications (Draft Open or Open Paid), or email distribution are tracked and will appear in the logged data as individual records. Consequently, the logging feature enables history tracking and supports auditing procedures. Log files are stored as attachments to invoice run, dunning run or subscription records. If the the Attachments related is not visible, you may need to add it to the page layout of the corresponding object. For details, see Managing Pages. Log file names consist of the creation timestamp and the extension .log. At the size of approx. 2 MB, the log file is closed, and JustOn starts writing to a new file. The log lines are ordered by timestamp in ascending order, that is, new events are written to the end of the file. INFO is the "finest" setting and generates the most log output. Each level includes the levels above, that is, the level ERROR, for example, logs events of the severity ERROR and FATAL. Logging is not enabled by default. To enable it, modify the corresponding global setting. In the field Log Level, specify the intended level of detail. Possible values include (in this order): NONE, FATAL, ERROR, WARNING, INFO. This activates the logging with the defined level. If the Log Level field is empty or set to NONE, JustOn does not generate log files. JustOn allows for sending information about batch chain execution via email. If set up accordingly, it notifies the user who has triggered the batch chain at the end of the execution. Be aware that JustOn creates and sends a notification if a log record of the corresponding severity level has been produced during the batch chain execution. You can, consequently, have JustOn generate log output of the level INFO but send notifications of the level ERROR only. The produced notification email includes links to all object records for which JustOn has produced log output. That is, if there has been an error with an invoice run, you receive a deep link to the corresponding invoice run record. Batch chain notifications are not enabled by default. To enable the feature, modify the corresponding global settings. Batch chain notifications require logging to be enabled. In the field Notification Level, specify the intended level of detail. In the field Notification Target, set EMAIL. This activates the batch chain notification via email with the defined level. If the Notification Target field is empty, JustOn does not send batch chain notifications.